As part of our 2018 National Conference, California Symphony executive director Aubrey Bergauer spoke to us about her organization’s learnings from Orchestra X, an ongoing exploration of orchestra leadership in a changing world. This plenary session was sponsored by Symmetrica: Creative Technology Solutions. You can find a recording of this presentation on our SoundCloud page. The accompanying slide deck can be found here. 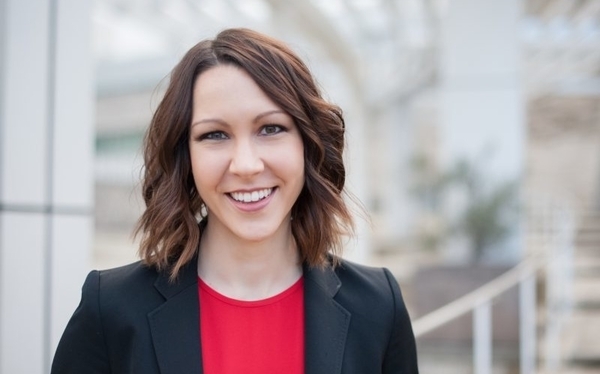 Aubrey Bergauer’s reputation as an organizational leader willing to test, implement, document, and share new ideas and approaches has been growing in the past few years, and Orchestras Canada has been following her work closely since 2016. We are delighted that she will be joining us at our conference in Calgary, leading a pair of sessions on Friday, June 1 – the second of these sessions is available on our Soundcloud page. Aubrey began as Executive Director at the California Symphonyin 2014, and soon started a project called Orchestra X. This project tracked the responses of a group of culturally active people to their first experience of attending an orchestral concert. The California Symphony team tracked this group’s impressions of the entire concert experience, from their first website visits to conversations had on the way out of the hall. A report on this project can be found here – but to summarize, the reasons that culturally active people don’t attend symphony orchestra concerts are varied, and there are aspects of each part of the concert experience that are problematic in attracting and retaining new audiences. We recently caught up with Aubrey to learn more about the research that she and her organization have been doing. Where do you see the Orchestra X project going from here? Single Ticket pages: The most critical site content, as nearly all our digital marketing directs to these landing pages. They are heavily trafficked and the largest source of information for people seeking concert tickets and those who have already purchased. English/Spanish Language options: Contra Costa County, where we are based, has a 25% Hispanic population; however, our audience does not reflect that. We have several initiatives in development to attract Spanish speaking audiences, but our website does not yet serve this group. Content: Videos, blog posts, playlists, photos – we want to be able to capitalize on the trend of content marketing and be able to present great content front and center. We also want to be able to better tell the stories of our education programs. Event Calendar – we’ve learned prospective patrons look for this and want it to be user friendly and obvious. Better Customer Relationship Management integration for ticketing and donations – Could we do this like Live Nation where it connects to your Facebook account and you can see if your friends have purchased tickets and where they are sitting? It would be awesome if we could have on the homepage, for example, that many of their friends had been to the Symphony before. And then on specific concert listings it would show if any friends were going to that particular event. Is this something that you are continuing to explore in the way that you communicate with your new and recently acquired audiences? We’ve had no problems with glowing screens or people violating union media capture agreements. Generally, folks show up to the concert, take their selfie with the orchestra warming up in the background, then post it to social media to show everyone they know, and put their phone away. Big victory for us. Sometimes during zealous applause/standing ovations, patrons (of all ages!) will film. And then they’re posting a hall full of people going nuts over our orchestra. Love it! Our music director is also great at ‘managing the audience’ with his hands. If he doesn’t want everyone to applaud after a slow movement, for example, he manages that with his gestures and how he ends the preceding movement. How would you describe the difference in attracting new audiences to orchestral concerts compared to how you convert these people into regular concert-goers? One of the first things I did at California Symphony was to institute a very disciplined audience retention plan. Despite our industry-wide mantra that we need new audiences, most orchestras are actually excellent at attracting new attendees, and where we collectively struggle is retaining them. The statistic in the U.S. is that 90% of first timers don’t ever come back. So I developed a plan that looks at building audiences through a long term approach with one desired next step for each audience segment, and everything we do points them toward that one next step only. For example, first time attendees receive four different communications inviting them back, as that’s the only thing we want them to do. 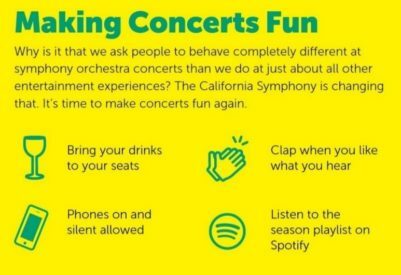 At the California Symphony, through this approach, our retention rate is now at nearly a third of first time attendees coming back again within 12 months of their first visit, and it’s trending even higher for the current season. And what about long-term subscribers? The message those patrons get is how much we love them and their loyal patronage, and we have multiple touchpoints throughout the year to communicate that. And the one next step for them is to donate if they haven’t yet. So the message is a lot about ‘normalizing the behavior.’ In other words, we strategically and intentionally convey how normal it is to donate (as opposed to ‘ticket sales only cover X% of the costs’ type messaging). The caveat to all this is that we treat first year subscribers differently in that this group (where the renewal rate is typically 50% or less in the U.S.) is not solicited for a donation because the one next step for them is to renew their season ticket package. Lastly, we decided this past year to apply one of our Orchestra X findings to subscribers: in our season brochure, we changed the format of how we write about each concert. Instead of a brief paragraph about each program, we shifted to ‘What’s Interesting About This Concert?’ with a few bullet points modeled after what we now do on our website. The renewal rate jumped to 89% for both new and existing subscribers. Through all of these tactics, every facet of our audience has grown. Since I joined the organization in 2014, our total annual attendance has nearly doubled and our donor base nearly quadrupled, defying the trends for most orchestras. So many things, it’s such an exciting time! We are constantly running small experiments, such as what makes a better first timer offer to return—a big discount or a cash-off voucher (early results show it might be the latter); or tweaking donation appeal language to see what best brings in the upgrade gifts; or running digital ads in Spanish to see if that alone could move the needle at all in terms of audience demographic composition. For me, what is most exciting about all the traction and visibility my work at the California Symphony has received, is that this has become my vehicle to do the things I care about most: champion equality and inclusion, invest in professional development and thought leadership for the field, work against the typical siloed organization structures, and contribute in ways that make an impact far beyond my corner of the world. I’m working to change the narrative for classical music, and I can’t wait to see you all in Calgary! For more information on Aubrey and her research, read her articles on Medium!